You must make bookings at least 5 minutes in advance of the time at Franco's. Green Park, St James's & Piccadilly tube stations are all 5 minutes walk away. hitch, whether it is an intimate dinner party or a large reception. Franco’s boasts a colourful heritage and loyal client base thanks to its legendary relaxed style, friendly service and fantastic food thanks to Italian Chef, Stefano Turconi, who presents genuine, refined cooking, presented with a modern flare. Breakfast offers a continental or full English breakfast. Set lunch at £24 for two courses and £28 for three is popular as are the changing daily specials and varied lunch a la carte menu. Afternoon frequenters enjoy a cigar on one of the outside tables along with Afternoon Tea. For those going to the theatre, arrive from 5:30pm for the theatre menu priced at the same cost as the set lunch. The a la carte dinner menu offers something for all with salads, grilled meat and fish along with pastas. Franco’s beautiful private dining room which can be split in two separate rooms accommodating 34 on one long table, 55 in the whole of the lower ground or 16 in the wine cellar. Our beautiful private dining space fits around you, however big your party or whatever the celebration. Franco’s is the perfect setting for your important function. With the flexibility to accommodate small groups of 2-16 guests or larger parties of up to 55 guests. Excellent restaurant in heart of St James’ . Had a basement table which not nearly as nice as the ground floor. However service was first class and the food delightful. We were talked into having too many additional vegetables, all at an extra cost but that was probably our fault but added to overall bill. Would definitely go again. Always a good experience. Reliably good food and service. Love Franco’s. It's a must if you 'love great Italian food'. Very Upscale. Great wine list and service. A must!!! Great food and great service! Highly recommend this restaurant to all. The service/venue and food was good. The only problem ... the portions were tiny! Nice old style Italian in Mayfair. Glass of primitive was delicious and macaroni with truffle also good. Service was quick and friendly. I would have preferred the ground floor, but downstairs quite good for a business lunch. Everything at Franco's is top notch - food, ambience and service are all absolutely first-class. A classic location which never fails to satisfy. First rate service, very good food, and an excellent Arneis wine made this a very good dinner. We will certainly be back. While we have never used it, the set menu seems extremely good value for the location and quality. Overall, top marks and well done. We had an excellent meal in very pleasant surroundings. The staff were very polite and helpful. Will definitely return next time I'm in London and also recommend to friends and family. Franco's is a great restaurant . Food is excellent , but more imporrtantly the staff are friendly and efficient . Ambiance is great . Really , nothing negative to say at all ! Love this place. Food and service always of a high standard! Franco's never fails to impress...........the food, service and ambience are simply amazing. The pineapple juice was tasteless and just tasted of cinnamon and the toast was cold. It was just ok. I have written a full Tripadvisor report. My Partner and I dined with two Dutch colleagues and frankly it was more than disappointing. but the Manager was smarmy. My suggestion to them is to sack the chef and the Manager or close the door. Yes! Amazing food! Amazing service! I would come back! Great food and service. The seabass, steak, and lobster ravioli were all incredible! Franco is a nice restaurant. The food was ok but not outstanding. I would say that the price reflects the location. Otherwise the food and service on their own would be overpriced for what they offer. Friendly place. 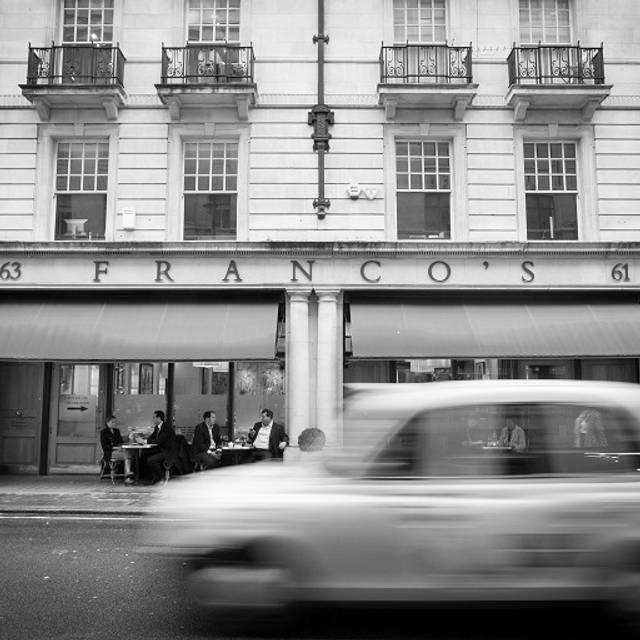 Franco's is our favourite London restaurant for a special occasion. 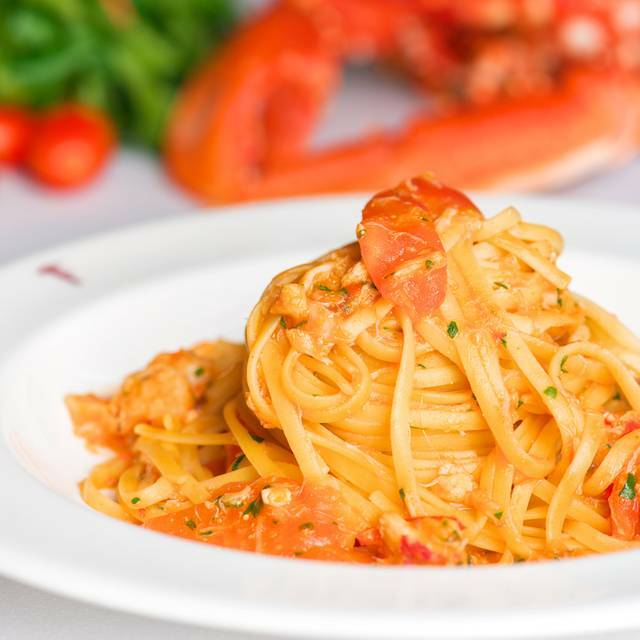 The Italian food is sophisticated and refined but always delicious. The service is attentive and helpful, and on our last visit was very special, making us feel wonderfully well cared for. Always a treat to be there. Erg lekker eten maar te duur. Bij alle gerechten moeten aparte bijgerechten besteld worden. Bestel je alleen een tonijn dan krijg je ook alleen een tonijn, Niet juist gezien de toch al behoorlijke prijzen. Eten wordt erg snel geserveerd zodat je met drie gangen binnen 1.5 uur weer buiten staat. Wij aten in de kelder. Ik had het idee dat boven gezelliger was. Bediening prima in orde. Mooie wijnkaart. Just thought we’d try Franco’s as not been for awhile. It was a lovely return. Food excellent and service to perfection. A very enjoyable evening in Franco's, good food, good wine, and great service, all very enjoyable. I am a person who probably eats less than most; I find the portion size exactly to my requirements and the quality outstanding. The noise level is a little on the high side for me, but overall it is a venue I shall certainly visit again. Great service and lovely food. Franco's never disappoints and is always a winner. Excellent meal! The marinated lamb entree was the best lamb my husband has ever eaten - even cooked medium well, tender as butter. Pan fried venison was also flavorful and tender. Friendly and efficient staff, a real delight. Amazing food and excellent service. We took our 9 week old son there for the first time and the staff made him feel very welcome. Had the pasta with truffles and loved it! Orders the steak too and although it was tasty, I had hoped that it already came with some sidings for better visual presentation. Overall service was good and I would definitely come back to this place again. Great restaurant. Highly recommended for business lunches as well as evening fine dining. Great place for a business breakfast or lunch. Food is excellent and staff really friendly and knowledgable. Franco's had a power outage so this limited their menu. The food was very simple in the circumstances and they willingly adjusted the price since we asked them to do so. It was a pity that they did not keep their lunch menu but only a very limited a la carte. The waitress barely understood English which was very irritating. There was a “technical problem” in the kitchen that meant that some hot food was not available. This happens but the restaurant had at least 3 opportunities to tell us this before we ordered our drinks. It wasn’t until we were seated with our coffees and ready to order that we were told that our food options were limited. This a regular spot for breakfast meetings for me, so I know the restaurant and will go back but am not impressed with the service this particular morning. Visited Franco’s as a last minute booking following a trip to the theatre. Food was good, but fairly average - certain dishes seemed a bit incomplete and not very cohesive. Service was again ok, but felt like it was an inconvenience ordering from the set menu rather than a la carte. Overall an average experience but was just missing that extra something special. Was visiting here from the US. Incredible food and the service was impeccable. Would definitely recommend. Incredible service and food!! We ordered the venison, burrata, and the tagliatelle with truffle. It was out of this world. It was my friend’s birthday, and they prepared the sweetest, most thoughtful dessert for her. Additionally, we came right before closing, which can understandably be difficult for the employees at the restaurant, but they made sure we were having a lovely time. I cannot praise the food enough. It was splendid. Ideal for late breakfast. Booked for 0900 but tablle in middle row was impossibly noisy. breakfast when most other diners had left.